← What about TD1208 / Sigfox current consumption ? Basically, it is something I was looking to do with SigFox, but unfortunately yesterday I bricked my chip because of a wire unsoldered right in the middle of the upload of a new firmware version … By the way, I’ll do it later once it will be fixed. 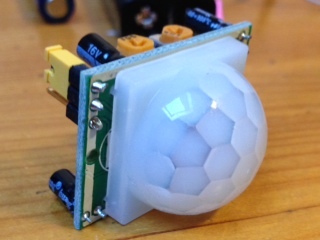 Basically this hack is requiring a raspberryPI and a PIR sensor like this one at adafruit. This sensor handle a 3.3V LDO regulator and as a consequence you have to plug it on 5V or more. 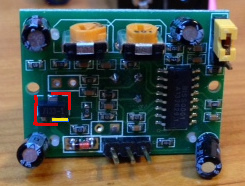 Or, like I’ve done, you can remove the regulator (in the center of the red line), shortcut in/out (yellow line) and makes it working on 3.3V. By-the-way, I recommend to connect it on 5V with RPI as you have it. 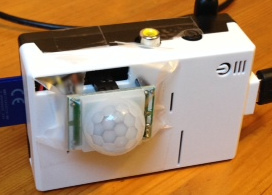 So you will be careful because the next picture with the RPI connectivity will differ. 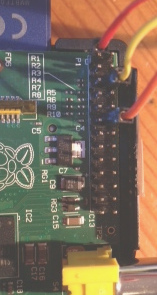 Now to connect the PIR sensor with the Rapsberry PI, you have to plug the power cable (vcc & ground) and the Pir out signal to the Gpio 1. As shown on the picture on the left, the VCC is connected to left row first pin (3.3V) . 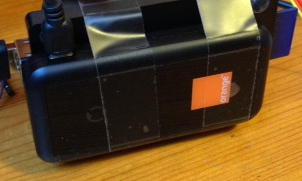 The last step is to manage the motion detection and report the change to a server. The system is designed to work with shell script only to make it simple. GPIO can be accessed directly based on /sys/ virtual filesystem. The status of the PIR is obtain by calling get_pir_status() function. As it can be interesting to get a PIR location based on the IP address, the function get_my_pos() is using the freegeoip.net service. The system scan PIR state during about 5 minutes. When during this period, te PIR is active at least one, the status activated will be reported. To preserve the communication, only state change will be reported to the backend. The 3G connection is tested each time as in my test, the stability of the connection is really low, the modem is hanging up after a few second of transmission. But is work enough time for the application. It’s good ! echo "[error] gpio init failed"
echo "Nouveau status : $see_last "
echo "Erreur connection Internet postpowned"
This entry was posted in IoT and tagged IoT, raspberry pi. Bookmark the permalink.